(The Jilline Ringle Solo Performance Program is dedicated to supporting the creation, development and production of work by female solo artists across a variety of disciplines - theater, performance art and cabaret. Jennifer Blaine was a Program resident in Summer, 2017. Together with collaborator Karen Getz, Jennifer brought her piece The Vicissitudes of Travel to 1812's studio for a week of workshopping and creation. Having a partner in crime is important. 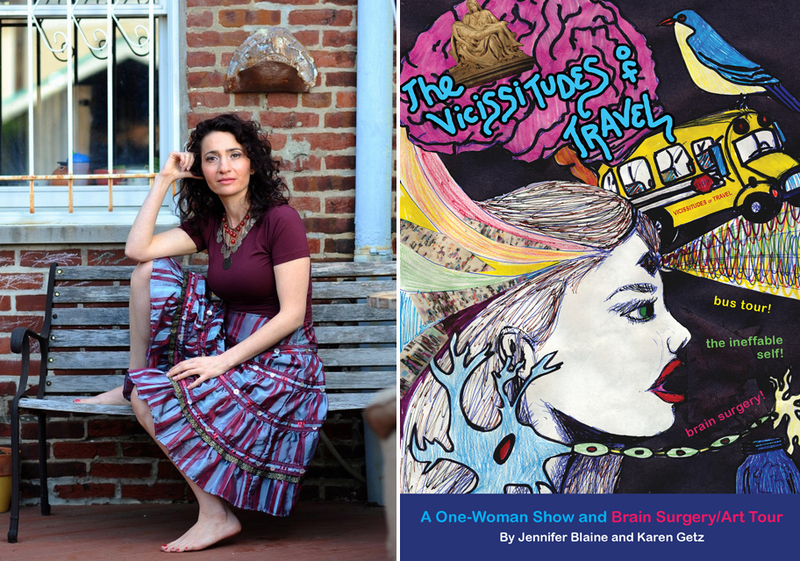 Even though I am the solo performer for “The Vicissitudes of Travel,” my director and co-creator Karen Getz is there with me every step of the way in the conception and writing process. We got so much from the glorious Jilline Ringle Residency. Being in communion with the other artists that were participating that week assisted us so much. Sometimes it helped to relate about our piece with the other artists, and sometimes it helped to shift gears and enter into an utterly unrelated conversation about gardening, and get some playful distance from the intensity of the mining process. The rehearsal room has some magical vibes! What we got for the piece itself was profound insight into the main character, “Sister.” Although the concept of collage had come up over and over in my writing, when we were in the rehearsal space I was transported to the actual act of collage, of standing at “Sister’s” work space and creating visual art which sparked this character’s opening monologue. To cement this knowing into the character, and then be able to write her accordingly, gave the piece a much stronger drive. Karen guided me to physically embody each of the characters in some exploratory work. There is a character in the show who could veer into just a joke, but adding in body awareness of her physical rejection of herself gives her a tension and something for me to actively work with and discover -- which keeps her dynamic. Um... I have to admit, I don’t like presenting my work in progress! I like having all things figured out, and then share with an audience. But being in presentation night at the residency was a friendly way of dealing with my resistance. I think because we shared mid-process I am now better at verbalizing and discussing what went into making the show possible with the audience, and to let them in on my creative process. During the presentation night we showed the audience the visual art the characters are seeing on their bus ride through brain surgery. That was a new element! It was amazing to see how we could really bring the audience along with us, just by introducing those key visual cues. The show is now running in FringeArts! I was able to project the Sister character to a group of strangers and have them really get her dilemma, and all my characters personally relate to the audience. The audience laughed heartily, traveling with us in their imaginations. At the end of the show, we invited them to collage at the side of the room. One audience member created a pieta using elements of art displayed throughout the show. She depicted an extraordinary sun emerging like a halo behind Mother Mary. “I’ve had a hard time with my mother dying,” she shared, “but I think there’s hope now.” Karen extended her hand, “Look! That’s the image you’ve created here. See? We’re all artists." (Read more about Jennifer Blaine and The Vicissitudes of Travel at FringeArts here. Jennifer Blaine photo by Jeff Fusco. The Vicissitudes of Travel poster design by Emily Morris.